Here is a quick and easy no egg / egg less french toast recipe. Egg less bread toast with whole wheat bread is my hubby's weekend breakfast. So i often try to make bread toast with or without eggs. And for my kids, i just give them boiled eggs along with the toast. 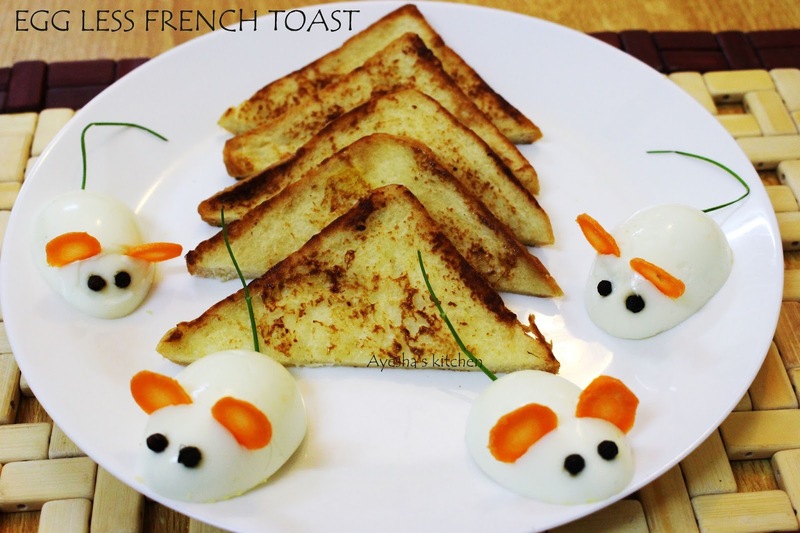 Since kids are attracted to various shapes, sizes and bright colors, presenting breakfast with some cute decorations will attract them to such healthy dishes. Here i decorated my toast with a cute mouse made of boiled egg, pepper corns and carrot. Hope this will be a quick breakfast idea for working moms. 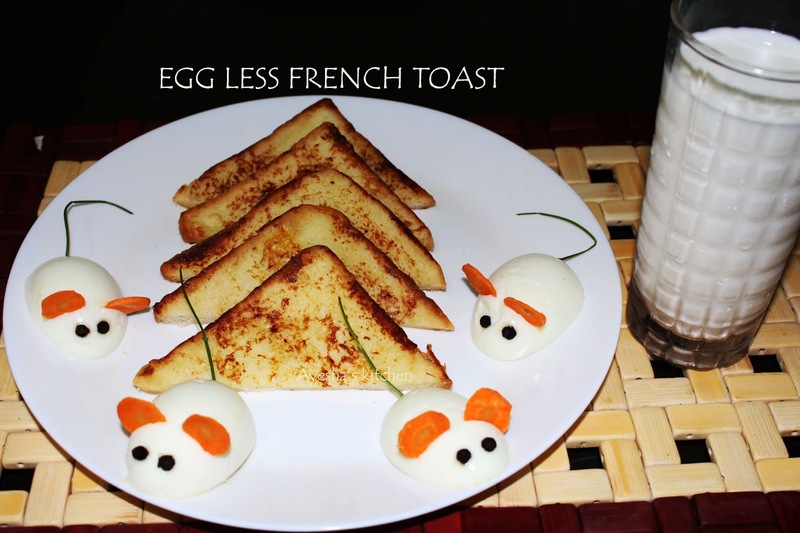 Do try this easy french toast recipe and let me know how it turns out for you. Take a bowl and add custard powder, sugar/ milkmaid, vanilla essence, salt. Add in the milk and mix well until sugar is completely dissolved. Heat a pan and add 2 tbsp of melted butter. (If u are using salted butter, then no need of adding a pinch salt in the milk mixture. I used unsalted butter. So for balancing the taste, i used a pinch of salt). Now dip the bread slices in the milk-custard mixture completely, soak well in this mixture and toast it on the hot pan until golden in a medium low flame. Each time before dipping the bread, stir the mixture well as the custard will soon settles down. Flip the other side and toast until golden. Toast in batches. Transfer it to a plate and serve hot.